They are excellent swimmers, a characteristic they need to survive in their environment. Kuri animals are intolerant to heat and sunlight and are unable to stand extended periods of drought. Consequently, they are fond of wallowing in water and spend a considerable part of the day immersed in the lake water with only the nostrils lifted above the surface. The Kuri predominates on the shores and islands of Lake Chad, which borders with Cameroon, Chad, Niger and Nigeria. Its main habitat is in southern Chad and north-eastern Nigeria but they are also found in northern Cameroon, in the N'Guigmi province of Nigeria and to a limited extent, in the Central African Republic and south west of Ethiopia. The origin is obscure and uncertain. One theory considers the Kuri as a pure Hamitic Longhorn, which descended from the ancient Egyptian or Hamitic Longhorn as depicted in the Egyptian drawings.The Kuri probably branched off the stream of the Hamitic Longhorn on its north-westerly passage from Egypt and migrated south-west ward through the Sahara corridor to Lake Chad. 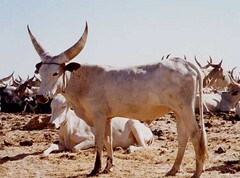 Another theory considers the Kuri to be of the Sanga (Bos indicus x Bos taurus) type that originated from the intermixture of lateral-horned zebu and the hamitic longhorn in upper Egypt and present day Ethiopia.